I have long been a fan of freecycle – in the last shared house I lived in, we managed to get ourselves a second fridge (so we could have more than one shelf each! ), a microwave when ours died and and tv when that did the same, all from freecycle. I’ve also managed to get rid of a good few things on there when having a sort out – it’s a great way to get rid of things quickly. So when I started sewing, I started keeping a look out on my local freecycle board for any fabric that anyone was getting rid of – I wanted some stuff to play with as I was getting started, without having to go out and spend lots of money on fabric, and also, without having to choose what I wanted without knowing what I was going to do with it. I immediately sent the poster and message, and was delighted when I got an email back asking when I could pick it up, and also asking if he could interest me in some cones of wool as well – why not I thought, I’ll learn to knit as well! This is the fabric I acquired – the photo really doesn’t do it justice, either the quantity of the quality of some of the fabrics, at some point when I have it all out, I’ll take some better pictures, so that I can see what I have and actually remember to use it! I’ve identified a couple of pieces that I really want to make into dresses, and I’ve already found uses for some of it – I made Marcus a fabric advent calendar this year, and, other than a couple of pieces of Christmassy coloured felt, all the fabric was from my freecycle stash. I also used it to create a hanging heart as a wedding present for a colleague, and it has contributed to a friend’s patchwork quilt. Who knows what else it will crop up in! While I was sorting out all my wares that I bought at Walthamstow market on Saturday, and was trying to find somewhere to keep them so that I could remember what I have, I decided to go through some of the freecycle stuff as well – turns out there’s a lot more good stuff than I initially thought – there are three lovely floaty fabrics with small flower prints which will make really nice summer dresses, and some great plain stuff that would make smarter dresses or skirts as well. In fact, I think I’m going to use one of them to make a nice floaty version of Simplicity 1913, which came free with Sew Magazine this month. I also managed to acquire myself a sewing machine on freecycle, although that was a whole saga! Long story short, I went from having one broken sewing machine, one old Jones sewing machine from freecycle, which is a bit temperamental but seems to work, and one new sewing machine which my parents gave me for Christmas. I’d seemingly inadvertently started a collection. Oops. I am now down to two, that’s fine right? 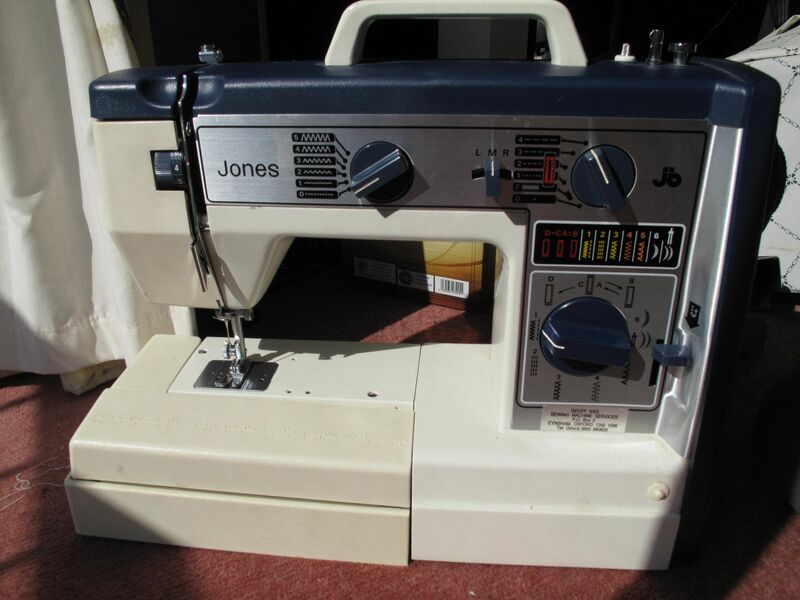 Here’s my old Jones machine – I think it’s possibly older than I am! 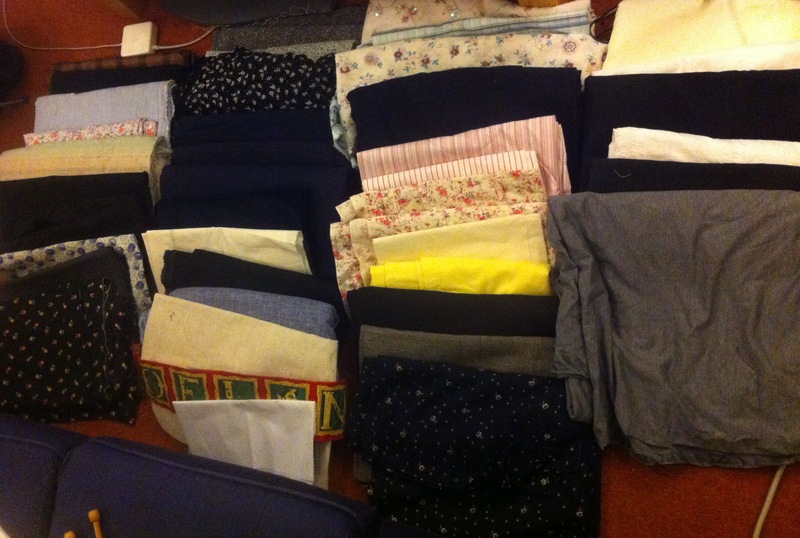 It’s definitely worth keeping an eye on freecycle and similar boards if you’re on the lookout for fabric (or a sewing machine! ), but for now I think I will stay well away, until we have somewhere bigger to live that is! thats awesome! I posted an ad on craigslist and got three HUGE bags of fleece weighing about 55 pounds I was in shock just like you haha! !